Ireland has given many sons to the Empire -- men illustrious as soldiers, sailors, statesmen. Their names are emblazoned on the scroll of fame. The story of their lives and deeds will pass down the ages in honoured remembrance, and will endure so long as the English language is spoken. In this goodly company, and in the minor or obscure position, stands the name of John Nicholson -- rather, it shines out with a stern and rugged grandeur all its own -- the heroic Nicholson, as the men of his own generation loved to call him. Now that through the perspective of years we are able more truly to gauge the man, his character, actions, and service, it is gratifying to learn that time has not dimmed the lustre of his name nor changed the verdict of his contemporaries. An able writer thus describes him:-- "John Nicholson was a man who nothing common did or mean. As a leader he chained victory to his standard. His iron will and stern sense of duty overlay the tenderness of a woman and the kindness of a true gentleman. As a magistrate, terrible to evil-doers, a rock of strength to the upright and honest, and merciful to offenders whom want or bad example had led astray." In these days of mawkish sentimentality and political and official incapacity and indifference, it is invigorating and instructive to turn to the life story of such a man as Nicholson. John Nicholson's father, Dr. Alexander Nicholson, was one of a family of sixteen children borne by Isabella Wakefield to John Nicholson, of Stramore House, Gilford, County Down. Dr. Nicholson took his medical degree at Trinity College, Dublin, and in his twenty-seventh year married, in 1820, Clara Hogg, of Lisburn. Her father, few years before, had practically ruined himself in the process of founding the linen industry in his native town, and on his death left his family in rather straightened circumstances. Clara Hogg's brother, James Weir Hogg, went out to India in 1809, where he amassed a large fortune, and, returning to England, became, in 1846. Sir James Weir Hogg. Dr. Nicholson, John's father, was a Quaker by long descent, but had been guilty of marrying a lady belonging to another Church, for which offence he was promptly expelled from the communion of the Society of Friends. Soon after marriage he obtained a post in a hospital in Dublin. In the Irish capital he appears to have practised with considerable success during the remaining ten years of his life. At the age of 37, in the year 1830, he died from a fever, leaving a young widow and seven children -- two daughters and five sons. Mary, the eldest, was born in October, 1821, evidently in Lisburn, there is a record of her baptism in the Cathedra! registry. 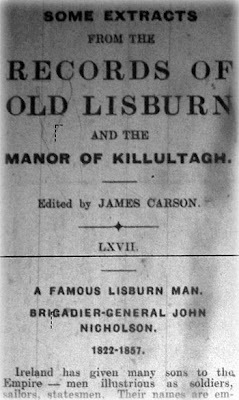 Captain Trotter, in his life of Nicholson, states that John was born in Lisburn on December 11, 1822. In the obituary notice in the "Illustrated London News" of November 11, 1857, his birthplace is given as Virgemont, Dublin. There appears to be little doubt but the latter account is correct, as the family were living in Dublin at the time of John's birth. On the decease of her husband the widow returned to Lisburn with her young family, and resided for some years with her mother, old Mrs. Hogg, in a house in Castle Street adjoining the Rectory, now used as a Masonic Hall. Later, Mrs. Nicholson removed to a house in Bow Street opposite the Ulster Bank, where she resided only a short time, and again removed to the farther of the two red brick houses beyond the Convent in Castle Street. Here she remained till she died in 1874 at the ripe age of 88, having survived by many years all her seven children with the exception of Mary, the eldest, who lived on until 1889. Mrs. Nicholson's five sons all died in India, with the exception of James, who died at home in March, 1840, the age of fourteen. Her younger sister married a Mr. Maxwell, and, on his decease, afterwards became the wife of Dr. Thompson, in whose memory the Thompson Memorial Home was erected. John Nicholson grew up much as other boys of his age. From an early date, however, he exhibited a seriousness of disposition and hatred, of mean or cowardly practices, and a fiery temper easily roused by anything which offended his sense of justice. He had the inestimable benefit of good practical teaching. His parents were earnest, upright, Bible reading Christians of a type still common in the North of Ireland. It is recorded that even when quite a little lad, should Master John see a shadow on his mother's face, he would say with a comforting kiss -- "Don't fret mamma dear; when I'm a big man I'll make plenty of money and give it all to you." Right loyally in after years did he keep his promise. About the year 1832 John Nicholson was sent to a private school at Delgany, in County Wicklow. In his twelfth year he was transferred to the Royal School Dungannon. It is also recorded in "M'Call's Recollections" that for a short time Nicholson attended Benjamin Neely's academy in Castle Street. 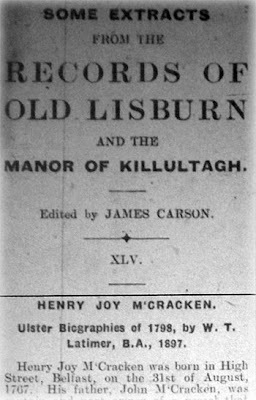 The boy spent his holidays in the old home at Lisburn, and in December, 1838, finally left Dungannon and school. Through the influence of his Uncle Hogg, John now obtained a cadetship in the Bengal Infantry. Early in 1839, at the age of sixteen, he bade farewell to his home and friends, hastened to London, made all necessary preparations to the voyage, and by the end of February in the same year the good ship Camden, with John Nicholson on board, was on the high seas ploughing her way to the scene of his future achievements and glorious death. Nothing unusual appears to have happened during the voyage, and about the middle of July he landed in Calcutta. Arrival in India. Firozpur. Ghazni. In a few weeks, proceeding up country, he reached Benares, where for a time he did duty with the 41st Sepoys. Only sixteen years of age, and in a strange and foreign land, no wonder his letters are sad and his heart lonely. He writes to his mother:-- "I go to church every Sunday, and read my chapter every day as you advised me. I find Mary's Bible very useful. Often when I am sitting alone here in the evening, I think of you all at home and say to myself, 'There is no place like home.'" His letters also showed his anxiety to live within his income, denying himself pleasures that he might save his money for the dear ones at home. Towards the end of the year he was permanently posted to the 27th Native Infantry, then stationed on the Satlaj at Firozpur. Here for a time he lived in a stable, sharing it with a brother officer. The fiery winds from the desert, the heat and, probably, filth, brought on a fever which temperance and a good constitution brought him safely through. He writes:-- "This station is a perfect wilderness; there is not a tree, or blade of grass, within miles." About this time he was reading with much interest Faber's Fulfilment of Scripture Prophecies, and reports himself as now nearly six feet high and likely to grow three or four inches more. In a few years the expected inches were duly added. Early in 1841 Nicholson's regiment was ordered the Afghan city, Jalalabad, and later on to Kabul, and thence to Ghazni. At the time, peace appeared to reign in Afghanistan, but the slumbering fires burned beneath, which was soon to burst forth, only to be quenched to the blood of 4,000 British troops who perished amid the grim Afghan passes to the vain attempt to reach safety. When the storm burst the hill fortress of Ghanzi was garrisoned by Nicholson's regiment. As the beleaguered soldiers looked out from their eyrie they saw the first snows of winter-whitening the ground, and with the snow, and numerous as the snowflakes, came the hordes of wild Afghan tribesmen. The defences of the fortress were out of order; there were guns, but no gunners, and the stock of ammunition and supplies was below zero. For over three months the native regiment and its white officers held this ruin against death, starvation, and cold, till, on March 6, 1842, all that was left of them marched out, depending on the sworn oaths of the Afghan chiefs that they would be conducted in safety to Peshawar. The promises were only made to be broken. The unfortunate soldiery fought on for fourteen days, and then the remnant laid down their arms. Young Nicholson thrice drove back the Afghan guard at the point of the bayonet before he surrendered, and then, while tears of grief stood in to honest eyes, flung down his sword at the feet of his captors. For over six months he and other British officers remained prisoners in the hands of the Afghans, till they were finally rescued and returned to India with that avenging and victorious army which taught the lesson to the Afghan tribes that British blood cannot be shed without risk, nor pledges broken with impunity. Alexander Nicholson's Death. Letters Home. Pro-Afghans. Returning down the Khaibar Pass with the army. Nicholson had the pleasure of meeting his brother Alexander, who had but lately come out. Three days later the elder brother, riding through the pass with the rear guard, espied, some distance from the line of march, in an elevated position, what appeared to be the naked body of a European. Cantering up to inspect it, he saw the body of a white man fearfully mutilated. Looking closer, he recognised the features of his own brother. There in the wild mountain pass, they two, the living and the dead; below, the sinuous trail of the moving army; above, the silence of the everlasting hills. Only, mere lads -- the dead, sixteen; the living, twenty; both true sons of the Empire. The younger gave his life for it, died in action, shot by a Khaibar robber; the elder -- well, he too gave his life for it; but his work was not yet done, his time had not yet come. It is worth noting his scornful bitterness on the ideas of some people at home regarding the late Afghan war. He writes:-- "One would imagine that the Afghans instead of being the most vicious and blood-thirsty race in existence, who fight merely for the love of bloodshed and plunder, were noble-minded patriots." Evidently in Britain in those days there were pro-Afghans, even as in latter there were pro-Boers and pro-Germans, "birds that foul their own nest." Thus history repeats itself. The First Sikh War. Henry Lawrence. Settlement at the Punjaub. In November, 1845, the first Sikh war broke out, and Nicholson served through it in the capacity of a commissariat officer. He was present on most of the hard-fought fields, and took part on February 10, 1846. in the crowning victory of Sabraon. At the close of the war a large portion of the Punjaub was annexed under Henry Lawrence, of Lucknow fame, as resident, Lawrence and Nicholson, for the first time, met at Kabul in 1842, and were mutually attracted to each other. When they met again, three years later, on the banks of the Satlaj, their mutual liking grew, by closer acquaintance, into a firm and lasting friendship. Nicholson was now appointed -- January, 1847 -- in conjunction with several other officers, assistant to Henry Lawrence. Probably no chief ever had a more capable, hard-working, or more suitable set of helpers for the stern work in hand. Their work was to rule a vast country, newly conquered, and to teach a fierce and turbulent people some plain elementary lessons of good government. Their names should be and would be household words if the text-books of our elementary schools were only compiled on ordinary common-sense lines, blended with a little kindly patriotism; whereas their names and deeds are now barely known except to the student of Indian history. John Nicholson himself, Edwards (who wrote the inscription for the tablet in Lisburn Cathedral). Taylor, Lumsden, Lake, Abbott, John Lawrence, Hodson of Hodson's Horse, and others -- men destined to be burned and hardened in the fiery furnace of stern duty through ten long years, against the time when Britain had sore need of such men. When the dark days of trial came in 1857 these men saved India for the Empire. By their ability, energy, and force of character they so overawed the native population of the Punjaub that it remained peaceful and loyal while the rest of India was aflame with the fires of mutiny and rebellion. On February 7, 1847, Nicholson left Kashmir to take up his new duties. The mountain passes through which he travelled were filled with snow to a depth of ten feet. Towards the end of April he arrived at Dera Ghazi Khan, on the Indus, where a pleasant surprise awaited him. Here he met his brother Charles, whom he had last seen some eight years before in Lisburn as a child of ten. "Fancy," John writes his mother, "neither of us recognised the other. I actually talked to him half an hour before I could persuade myself of his identity. He is as tall, if not taller, than I am. Our joy at meeting you will understand." A few days later the brothers part, and John proceeds to Lahore, where he spent part of May and June under the same roof with his friend and master, Henry Lawrence. Here he saw and learned something of the unsparing labour and self-denying zeal of a great and good man in the interests of a downtrodden people. So highly did Lawrence think of his young assistant that he now entrusted him with full political control over a broad district between the rivers Jhilam and Indus. At last Nicholson was in a position after his own heart, and that called forth those splendid powers of administration and command which were the admiration of the world. The country he was sent to govern was wild and rugged in the extreme -- a sea of fort-capped hills with narrow strips of valley between. The people, sparse and scattered, comprised, men of many races and customs -- warlike Pathans, cattle-lifting Gujars, and peaceful Jats. Law there was none; no man's property was safe, nor his life either. Out of this chaos Nicholson was to bring order and he did. Soon the Sikh sirdars and officers discovered the fearless and resolute determination that slumbered beneath his calm exterior. The people learned to look on him as an upright judge and powerful, protector. All classes soon came to see in the new sahib one whose orders must be accepted as the decrees of fate which none could defy and live. Nicholson's method's of government were undeniably drastic; but admirably suited to the people and circumstances. He was all action, looking and fighting for quick results. There was no binding him by the ordinary rules of procedure. He saw an end to be gained, and went for it straight, overleaping and overriding all precedents and regulations. At first the people of his district regarded him as a hard-hearted, self-willed tyrant, but by degrees, as his self-abrogation, daring, and swift and stern justice became known to all, this impression gave way to a feeling of awe and admiration. His strength and endurance were marvellous. A ride of 30 miles before breakfast to the scene of some murder or to inspect a boundary fence, five or ten hours at a stretch in the saddle, were mere bagatelles. Twelve years after his death a border chief told:-- "Our women even now at night wake trembling and saying they hear the tramp of Nikalsain's war-horse." When the occasion arose to strike, he struck with terrifying suddenness; The lightning-like rapidity of his movements had an astonishing effect on the native imagination. To illustrate: On one occasion he was ill in bed with a sharp fever, when word came of a rising some fifty miles out. Instantly he rose from his sick couch and mustered sixty Pathan horsemen, with some infantry to follow. The shades of evening were closing in when he started on his long ride. The rays of the morning sun were reddening the mountain tops as he reached his destination. The sixty had dwindled to little more than thirty, so rough the way and so fast the pace. Just in time to prevent the plotters closing the gates against him, he rushed inside the fort with his scanty troops. Striding amongst the garrison like an avenging deity, his haughty bearing and bold words won over the majority, and in the end he forced them to arrest their leaders. Again: With a perfectly inadequate and inferior force of raw levies he prepared to attack a strong regiment of infantry which was in semi-revolt and posted in a secure position. Summoning the colonel of the offending regiment before him, he offered certain terms, pulled out his watch, and said, "If they do not return to their duty in half as hour I will attack." It was a splendid game of bluff, and won. In the nick of time the colonel returned and begged pardon for himself and men, and the incident closed. 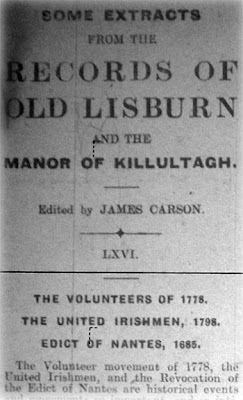 The Volunteer movement of 1778, the United Irishmen, and the Revocation of the Edict of Nantes are historical events and movements so important, and so intimately related to the history of Lisburn, that a short and concise account of them, and of their bearing and influence on the fortunes of Ulster, will not be out of place here. 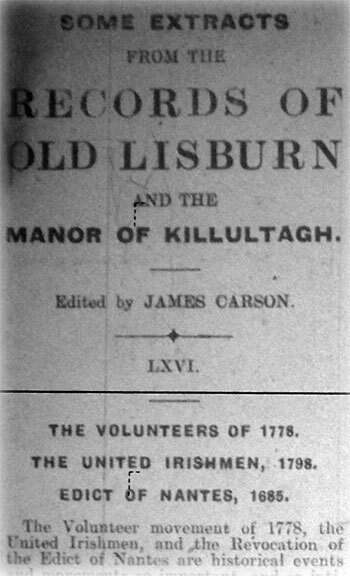 The "Revocation" was directly the cause of giving to the town of Lisburn, during the reign of William III., its French Huguenot population and the linen industry. Louis Crommelin, a native of Armandcourt, near St. Quintin, lived in Lisburn, and was known as the "Director of the Linen Manufactory." He died in June, 1727. aged 75 years. In the Cathedral grounds, in the eastern corner, the ashes of many of these exiles have long reposed. A gravestone there bears the following inscription:-- "Six foot opposite lyes the bodye of Louis Crommelin, born at St. Quintin, in France, only son of Louis Crommelin and Anne Crommelin, Director of the Linen Manufactory, who died beloved of all, aged 18 years, 1 July, 1711." In writing this article the Rev. J. B. Woodburn's valuable work. "The Ulster Scot: His History and Religion," was largely drawn upon. Revocation of the Edict of Nantes, 1685. In France the Edict of Nantes, which had been in existence for many years, permitted the Huguenots to enjoy a measure of religious liberty. But for some time Louis XIV. had been treating these Protestants shamefully. Soldiers were billeted on those who obstinately refused to change their religion, and conversion by lodgings was added to the other methods of securing conviction. Many poor men who had hitherto held out changed their religion when they saw the daily insult and outrage offered to their wives and children. After being in existence 87 years, the Edict of Nantes was formally revoked on the 18th October, 1685. The public celebration of Protestant worship was absolutely forbidden; all pastors must leave the realm in 15 days; they were doomed to the galleys for life if they dared to officiate again. All children were to be brought up as Roman Catholics. The result of this revocation was that large numbers of Huguenots emigrated to other countries. Probably half a million left France at this time. At the beginning of the American War there was no militia in Ireland, and only 4,000 soldiers for the defence of the country. When France joined America in 1778 the English ships that had been stationed on the Irish coast were recalled and sent elsewhere. A feeling of insecurity gained ground throughout the country. The Channel was swarming with American and French privateers, who prevented all trade with England. Paul Jones, the American freebooter, was off the coast, and actually defeated the Drake sloop-of-war off Carrickfergus in April, 1778. A demand was made by Belfast to the Government for assistance. None could be given, so no course was open to the inhabitants but self-defence. A Volunteer corps was raised. The movement spread rapidly. The peers and the country gentry put themselves at the head of the local corps, and gave freely and generously of their means. Every city, town, and village swarmed with Volunteers. Physician, surgeon, and apothecary, lawyer and attorney -- all were soldiers. The plough, the loom, and every industry supplied its quota. The title of reverend, too, was frequently exchanged for that of captain. In a short time a self-created, self-arrayed, and self-supporting army presented itself, which strangers contemplated with wonder, enemies with fear, and friends with pride and exultation. The Catholics, not being allowed to carry arms, could not join the movement, but they subscribed of their means to purchase weapons for others. In a few months 42,000 men were enrolled and gradually becoming disciplined. The Government did not pay, clothe, or arm the Volunteers, nor did the force take a military oath. The Volunteers very soon became aware of their own strength. They demanded in 1779 Free Trade and Parliamentary Reform. They backed their demand by a demonstration in Dublin, and lined the streets through which the Speaker and members of Parliament passed on their way to Dublin Castle. Later, on King William's birthday, the Dublin Volunteers paraded round his statue, and had two cannon drawn up in front of it, labelled "Free Trade -- or this." The British Parliament understood the force of the argument, and repealed the trade restrictions within the kingdom which had ruined Irish commerce for nearly a century. The Presbyterians had been the first to join the Volunteer movement in the North, and through their influence the Sacramental Test Act was repealed in 1780. This Act, passed in 1704, made the taking of the sacrament according to the rites of the Established Church a condition of holding any office, civil or military, under the Crown, above the rank of a constable. The Presbyterians, the Independents, Huguenot immigrants, the Quakers were all swept under the same political disabilities, and at once cut off from the army, the militia, the civil service, the commission of the peace, and from seats in the municipal corporations. The loyal, industrious, law abiding citizens thus persecuted comprised more than one-half, practically two-thirds, of the Protestant population of the country. The Act, of course, also applied to Roman Catholics, but, as Froude, the historian states, "it appeared as if laws against Celt or Papist in Ireland were only made to be laughed at, while against the dissenters they were enforced with zeal and vigour." It was further enacted that the children of all Protestants not married in an Established Church should be treated as bastards. At the close of 1781, the Volunteers numbered 80,000 men. In 1782 some 242 delegates, representing 25,000 Ulster Volunteers, met in Dungannon and passed resolutions in favour of an independent Parliament in Ireland, and further relaxation of the Penal Laws against Catholics. Up till this date the Irish Parliament legislated subject to Poyning's Law, passed some two centuries before, which forbade the introduction of bills into the Irish Parliament that had not been first submitted to the English Council. Grattan brought forward the Dungannon demand in the Irish Parliament, and in May, 1782, the English Parliament repealed Poyning's Law and granted an independent Parliament to Ireland. Following the Act granting legislative independence came one repealing several oppressive measures in force against the Catholics, and another legalising marriages celebrated by Presbyterian ministers amongst members of their own denomination. In September, 1783, another convention of the Volunteers was held in Dungannon to press on the Government the necessity for Parliamentary reform and a better representation of the people. Delegates from the Volunteers of every county in Ireland were summoned to attend in Dublin in November. Parliament, was sitting at the time, and the Volunteers deputed Flood and other delegates, who were members of Parliament, to appear in the House and ask for leave to introduce a Reform Bill. Permission was refused. The Catholics were now enrolled in the Volunteer Force, and at its zenith it numbered some 130,000 men, with probably 50,000 actually with the colours. From this time forward the aim of the movement was Parliamentary Reform and Roman Catholic Emancipation. The day, however, on which Flood and the other delegates were refused permission by Parliament to introduce a Reform Bill was the turning-point, and thenceforward the power of the Volunteers began to decline. In March, 1784 a Reform Bill was again introduced and defeated, and the conviction sank deep into the minds of many that reform in Ireland could only be effected by revolution. The government of Ireland under English rule for over a century had been corrupt and oppressive. Now Ireland had an independent Parliament, and yet, save for some amelioration of the lot of Dissenters and Catholics, there was no improvement. There was pronounced discontent throughout the land. Theobald Wolfe Tone in 1791 founded the first Society of United Irishmen in Belfast. Tone's hope was that the Presbyterians should join hands with the Catholics to secure proper representation in Parliament. Some idea of the constitution of the Irish House of Commons at this time may be gathered from the fact that 50 borough members were each returned by less than 10 electors. Some of the boroughs were absolutely uninhabited. Seats were openly bought and sold. Belfast had a population of 15,000, yet the electors consisted of 13 men. Catholics were not allowed to vote for members of Parliament till 1793. The United Irish movement at first was non-sectarian. In the North the members for the most part were Ulster Scots and men of the middle class; Catholics did not join to any great extent during the early years. The Volunteers gradually merged into the Society of the United Irishmen, and it is recorded that the Volunteers of Broughshane and of Lisburn attended mass in the chapels of their respective districts to show their good intentions towards their Catholic brethren. Disaffection was growing throughout the year in 1793 and 1794. About 1794 a body of militia was formed to keep the country peaceful. In February, 1793, a conference was held in Antrim by the United Irishmen, and they decided to arm and accumulate military stores. The Government remained obdurate and refused all concessions. In 1795 the United Irish body reorganised on a new basis as a secret society. Formerly its stated object was an honourable one; from this forward its real aim was to overthrow the Government and establish a republic. At the head was a National Directory of five men, who sat in Dublin and who had charge of the whole Society. About 1796 a military organisation was introduced, and drilling and arming went on apace. Early in 1795 the celebrated meeting of Tone, Russell, Neilson, and McCracken took place on Cave Hill, Belfast, where they swore to use all their efforts to overthrow the power of England in Ireland. differed from the United Irishmen in being wholly Catholic, and sprung into prominence about this time. On September 21st, 1795, the Defenders attacked the Protestants at the Diamond, Co. Armagh, and were utterly defeated and a large number of them killed. On the evening of that day the Orange Society was formed. It was originally a league for defence. Persecution of the Catholics in Armagh and neighbouring counties followed, chiefly by the Peep of Day Boys, who assumed the name of Orangemen, thus giving colour to the belief that the outrages were committed by members of the Orange body. One immediate result was to undermine the friendliness that had existed for some years between the sects in the North, and to hinder the aim of the United Irishmen -- the co-operation of all creeds against England. The state of Ulster in 1796 was alarming. Belfast, Lisburn, and the Counties of Antrim and Down were all infected. Great crowds of 500 to 2,000, or even 6,000, assembled in various places, but they were always orderly and sober. In 1796 a new force called the Yeomanry was enrolled, chiefly in Ulster. It was recruited from the gentry and their retainers for the preservation of their own property and to protect the country against the Defenders and United Irishmen. December, 1796, saw the first attempt of the French, under General Hoche, to effect a landing in Ireland. The expedition consisted of 43 ships, with 15,000 soldiers. Ill-luck, bad seamanship, and storms prevented the landing after they had reached Bantry Bay, and, like the Spanish Armada, they gladly returned from whence they came. While the French lay in Bantry Bay the South remained quiet and loyal to the Government. In the North alone were there signs of disloyalty, accounting in some places to anarchy. In March, 1797, the Government, fearing a rebellion, instructed General Lake to disarm the inhabitants of the Northern province. There were now forces in Ireland amounting to 15,000 regular soldiers, 18,000 militia, and 30,000 yeomanry. It was the yeomen who in general were employed in the search for arms, as they knew the country and the people. They were without discipline and under no strict martial law. Their brutal treatment of the people stirred up fierce and lasting resentment against the soldiers, and especially against this new force. A Welsh cavalry regiment sent over called the Ancient Britons, in particular emulated the yeomanry. A reign of terror ensued. Flogging was a common punishment. United Irishmen, suspects, people who were perfectly loyal, all suffered. An eyewitness writes:-- "Going to meet the main body of the Ancient Britons I was directed to them by the smoke and flames of burning houses, and by the dead bodies of boys and old men slain by them, though no opposition whatever had been offered, and as I shall answer to Almighty God, I believe a single gun was not fired but by the Britons or yeomanry." a proclamation was made offering a free pardon to all United Irishman who had not committed certain crimes, on condition that they took the oath of allegiance prior to June 25. Many Ulstermen made their submission, for they saw that without foreign aid they could not succeed. Outside Antrim and Down and the east part of County Derry, where the Dissenters were in the majority, the province began to be loyal. In fact, in Ulster the insurrection was confined to those centres where the United Irish spirit had been grafted on the discontent generated by landlord evictions and long and bitter injustice to the Presbyterians. It is probable that the rebellion which broke out in May, 1798, near Dublin, might not have affected Ulster at all had it not been for the execution of William Orr, one of the leaders of the United Irishmen, at Carrickfergus in October, 1797. "Remember Orr," by F. J. Bigger, tells the story of Orr's life and death. It was at this time the different parties began to wore distinctive colours; the yeomanry and the Orangemen, who were on the side of the Government, wore orange, and the United Irishmen wore green. During all its history the United Irish Society was honeycombed with informers and spies. The paid informer was everywhere. Duggan, from Tyrone, took part in the rebellion, and yet in one year drew £500 as a Government spy. Maguckian was the legal adviser of the United Irishmen, and defended Orr at his trial, yet systematically betrayed his clients. Macnally, "the patriot barrister," was for 30 years in receipt of a pension. Magan, who betrayed Lord Edward Fitzgerald, was a United Irishman. Turner, who betrayed Orr, was on the executive of the United Irish Society, and the trusted friend of Lord Edward. In the beginning of 1798 the Society throughout Ireland numbered about half a million members, of whom about one-half were armed, and of these 111,000 were in Ulster. Lord Edward Fitzgerald, a Protestant, was in command of the rebel forces. Sir Ralph Abercomby, a brave and honourable gentleman, succeeded General Lake in command of the Government forces in November, 1797. After he took over command and had made a tour of inspection he wrote -- "Within the past twelve months every crime, every cruelty that could be committed by Cossacks or Calmucks has been transacted here. He endeavoured to restore discipline and to put down the excesses of the soldiers. This did not meet with the approval of the Irish Government, and he was forced to send in his resignation in April, 1798. Lake was reappointed in his place and martial law proclaimed. Then began a reign of horror almost unparalleled in modern Europe. The half-disciplined soldiery and the undisciplined yeomanry were quartered on the defenceless people. They lived as if they were in an enemy's country. Torture and flogging were common occurrences. Women were exposed to every species of indignity, brutality, and outrage. It was arranged that the insurrection should begin on May 23rd, but a few days before Lord Edward Fitzgerald was arrested in Dublin. The rising took place on the appointed day, but was greatly disorganised. In Kildare, Wicklow, and Wexford it broke out with great fierceness, due to the excesses of the military. In County Wexford the rebels were more successful than in any other part of Ireland. The county fell into the hands of the Catholic mob, and they held it for a whole month. On the 5th June occurred the scene of horror at the barn of Scullabogue, where upwards of 200 prisoners of both sexes were destroyed by the rebels. The barn was set on fire, and those who tried to escape were either piked or driven back into the flames; the rest were suffocated or were burnt to death. In the South the rising was essentially religious and Roman Catholic, and although a Protestant was elected leader, the real leaders were the Roman Catholic priests. In Ulster the rebel forces were mainly composed of Dissenters, and the rebellion did not assume extreme religious bitterness. The rising did not take place in the North for a fortnight after it had begun in the South, owing to the capture of some of the leaders. The rumours, too, of the religious nature of the outbreak in Wexford cooled the ardour of many. Henry Joy M'Cracken was hastily chosen as leader. He laid his plans with skill, but there was, as usual, a traitor in the camp, and the Government knew of his dispositions. The people of Belfast, Carrickfergus, and Lisburn were overawed by the strong garrisons stationed in these towns. They were hemmed in on all sides, and for them a rising was impossible. Risings, however, took place in almost every other town, village, and hamlet of Co. Antrim. Randalstown was attacked and captured. Toome Bridge over the River Bann was destroyed, and on the morning of June 7th the insurgents were converging on Donegore Hill for the attack on Antrim. The risings in Co. Down did not take place till the 9th. The story of Antrim and Ballynahinch is told in another place. The rebellion ended for the rebels in disaster and defeat at Vinegar Hill, Co. Wexford, on June 21st. The scenes there and at Scullabogue impressed the Northern mind, and Ulstermen began to ask themselves the question whether, if the rebellion succeeded, it would not be for them one of the greatest of calamities. The Bill for the Union of the Parliaments of Great Britain and Ireland took effect January 1st, 1801. The Church Disestablishment Bill became law on January, 1871. Irish Land Acts were passed in 1880 and 1881. More recently other Acts were passed by which the farmer has been enabled to purchase and become the owner of his own holding. the insurgent leader at Ballynahinch, was captured near Dromara, tried by court-martial in Lisburn on June 18th, 1798, and condemned to be hanged and beheaded the same afternoon. The scaffold was erected in the Market Square, close to the left-hand, or south-west, corners -- looking towards Bow Street -- of the premises now occupied by Duncan & Sons. In 1798 the corner house was occupied by James Ward, a punter and bookseller, and on the ledge of an upper window of this house part of the scaffolding rested, greatly to the annoyance of the Ward family. The day of the execution was wet, and the handle of the axe was so slippery that the executioner said he could not hold it properly. One of the dragoons present pulled a piece of chamois out of his wallet and threw it to him. Wrapping it round the handle, the headsman put such force into the blow that he not only severed the head from the dead body, but at the same time broke the handle of the axe. The axe, broken handle and all, were put in the grave with the headless corpse. The head was subsequently buried with the body. Before his execution Monro received the sacrament from Dr. Cupples in the rectory. No stone or monument marks the last resting-place of Monro. As you enter the Cathedral grounds by the main entrance from Market Square, immediately on your left is a small grass square, bounded on one side by the Mercer vault and on the opposite side by the Stannus tomb. Here, in this little square of earth, close to the Mercer vault, repose the ashes of Harry Monro. About the middle of the nineteenth century some excavations were being carried out in the Mercer grounds, when the side of Monro's grave fell in, exposing the contents. The workmen removed the axe and the broken handle, with the chamois still attached. The relics passed into the possession of George Stephenson, a well-known Lisburn solicitor, and on his decease they became the property of Theodore Richardson, Lissue, Lisburn. Monro, M'Cracken, Orr, Russell, Neilson, Hope, Porter, Dickson, and many other leaders in the North in 1798, must not be confused with their successors in the following century and the so-called "patriots" of Easter Week, 1915[sic]. The men of the North in '98 were not fighting for sentiment, religion, or insane "national aspirations." They were fighting under a grievous sense of injustice and wrong. They were fighting for a small measure of justice and fair play. For long years they tried to gain redress by peaceful methods, and only as a last resort appealed to arms. They would appear at the time to have failed, but who can say? The old, bad days have passed away. There is now justice and freedom in the land for all. The Ulsterman harbours no sentimental grievances out of the past. Given equity and justice, his instincts are to become a good and loyal citizen of his adopted country, wherever it may be. He suffers fools reluctantly, is slow to move, makes a good friend, and is exceeding tenacious of his rights. These same Ulster Scots of '98, it can well be understood, in 1914 would, with their brothers of to-day, have been amongst the very first to spring to arms at the call of Empire. These gallant leaders of a bygone age, we can well imagine, would now look with scorn and contempt on the agitators, politicians, visionaries, and votaries of chimerical national aspirations, who in these days of trial in the Great War have dragged the fair fame of Erin through the mire, and made the name of Ireland to stink in the nostrils of self-respecting nations. The reader anxious to study further the characteristics of the Ulster Scot and his growth between 1600 and 1800 is referred to an article entitled "The Making of the Ulsterman" in the "Scotch-Irish in America," Second Congress, 1890. Ulster Biographies of 1798, by W. T. Latimer, B.A., 1897. Henry Joy M'Cracken was born in High Street, Belfast, on the 31st of August, 1767. His father, John M'Cracken, was captain and part owner of a vessel that traded between Belfast and the West Indies. He was descended from a Presbyterian family that had settled at Hillhall, near Lisburn, when driven from Scotland by Prelatic persecution. His mother was Ann Joy, daughter of Francis Joy, who, on the 1st of September, 1737, established the "Belfast Newsletter," the third newspaper published in Ireland. The family of Joy, or Joyeuse were of Huguenot descent; having fled from France rather than sacrifice their Presbyterian faith. Samuel Neilson formed the idea of joining his country men, both Protestant and Catholic, into one grand confederacy of United Irishmen, who, instead of injuring one another, might combine to overthrow the enemies of their country. The first object of the association was to obtain Parliamentary reform, and thus prevent a few hundred Episcopal landlords from ruling an entire nation. At first the United Irish Society was a lawful association, established for accomplishing a most desirable object. Its founder was Neilson, but Henry Joy M'Cracken laboured late and early with all the energy of his enthusiastic nature to promote its interests. Before long, the leaders of the United Irishmen became discouraged at their want of speedy success in procuring Parliamentary reform by legitimate means, and, most unfortunately, began to aim at setting up a republic, after the example of the French. Accordingly, the society was remodelled, and in March, 1795, M'Cracken took the teat of the new organisation. Henceforth he devoted much of his time and energy to advocate its principles and forward its interests. There is no doubt whatever that the Protestant United Irishmen of Ulster were by far the most formidable body with which the Government had to deal. They were numerous, more intelligent, and better organised than their brethren in any other province. An adjutant-General was appointed in each county, and under him were a number of colonels. In Antrim the colonels held a meeting about the beginning of June, and pressed the general, Robert Simms, to take the field; but he opposed the resolution and resigned his command. M'Cracken was soon afterwards appointed in his stead, and he became not only adjutant-general for Antrim, but commander-in-chief of the United Irish Army of the North. He planned for attacks to be made simultaneously on Randalstown, Ballynahinch, Saintfield, Newtownards, and Portaferry. M'Cracken determined to make his chief attack on the town of Antrim, and there he commanded in person. One hour after M'Cracken attacked Antrim he was master of the town, and the victory seemed to be won. Meanwhile reinforcements, superior in numbers to the entire rebel army, had arrived under Clavering and Durham, from Blaris camp and from Belfast. The battle was now won by the Royal troops, but at the expense of many killed and wounded. Undaunted by this defeat, M'Cracken collected the remains of his army at Donegore, and determined to attack the Royal troops at Ballymena. But the insurgents, baffled by defeat, dispersed so rapidly that very soon he could count only about a hundred followers. These also soon dispersed, and he was finally captured near Carrickfergus. The trial took place on July 17th, in the Exchange, Belfast, when he was condemned and ordered to prepare for immediate execution. At five o'clock M'Cracken was ordered to the place of execution -- the old market-house which stood at the corner of Corn Market and High Street, and which had been given to the town by his own great-grandfather. The hangman had accepted a bribe to discharge his duty so as to save the prisoner's life, and medical friends were ready to apply every remedy as soon as they received his body. M'Cracken ascended the scaffold and attempted to speak to the people, but his words were drowned by the trampling of the cavalry, and he quietly resigned himself to his fate. Years before this fatal day he had told a friend that he did not desire to ever die of sickness. In a few minutes all was over. His body was given to his friends, but all efforts to restore animation were unsuccessful. His remains were buried in the graveyard beside the Episcopal church in High Street. Some years afterwards the parson of the parish got many of the graves levelled, and the ground sold for building purposes. The dust of the patriot lies under one of the houses erected on this site. His coat and sword may still be seen in the Belfast Museum. M'Comb's Guide to Belfast and Adjoining Districts, 1861. On the morning of the 11th June. 1798, Munroe -- who had been a Volunteer -- a man of good military talent, "spoiled," says Teeling, "by a romantic love of glory and a mistaken feeling of honour," despatched one of his officers, named Townshend, to take possession of Ballynahinch -- a commission which was easily executed, as the garrison fled at his approach. On the 12th Munroe marched for Ballynahinch with the remainder of his force. (With that detached under Townshend it amounted to nearly 7,000 men.) On his way he learned that the Royal troops under General Nugent, supported by the artillery of General Barber, had left Belfast to intercept him. It was not long before their approach was indicated by unmistakable signs. As far as the eye could reach they had fired the country along their line of march. The two armies shortly came into collision. For upwards of an hour Munroe succeeded in keeping the Royal forces in check. He had, however, no artillery except a few small ship guns -- some six or eight -- mounted on country cars, while the British artillery was effective and well served. Obliged at length to give way, he sent instructions to Townshend to evacuate Ballynahinch, a part of which had already caught fire from the enemy's shells, and drew off his forces to the neighbouring hill of Ednavady. The British troops entered the town late in the evening, and began plundering, burning, and drinking. The disorganisation caused by these excesses afforded the insurgent army an opportunity during the night of repairing the disaster of the day. A council of war was held, and instant action was urged by all except Munroe. "We scorn," said he, "to avail ourselves of the ungenerous advantage which night affords. We will meet them in the blush of open day; we will fight them like men, not under the cloud of night, but the first rays of to-morrow's sun." This decision was so unpopular among Munroe's men that a well-armed division of about 700, with their leader, marched off en masse, and numerous other desertions followed. At dawn on the 13th Munroe formed his men for action, and soon after commenced the attack by cannonading the town as best he could with his inadequate means. His small h=guns were promptly replied to by the heavier artillery of the enemy. A strong division of insurgents marched from Ednavady hill, with the view of entering the town on the right; a still more formidable column, led by Munroe, directed its march to the left. The former drawn up solid column, received a body of troops despatched by Nugent with a destructive fire, by which their leader was killed, and they were compelled to retreat to the town. Munroe's division, bearing down all opposition, entered it under a dreadful fire of musketry and grape. A piece of heavy artillery fell into the hands of the pikemen, who charged to the very muzzle of the guns. Munroe gained the centre of the town, where he was exposed to a cross-fire of musketry in the market square, and raked by artillery. His ammunition failing, he made an irresistible charge with the bayonet and the pike. The British general ordered a retreat. The insurgents, unacquainted with the trumpet's note, and enveloped by the smoke, mistook the sound for the signal to charge, and, conceiving that the enemy had been reinforced, fled precipitately from the town in a southerly direction, while the Royal troops were as rapidly evacuating it on the north. The consequence was an utter rout of the rebels. The 22nd Light Dragoons charged the flying insurgents, and were joined by the infantry who had rallied. Munroe regained his former position on Ednavady, but too late to offer decisive resistance. There remained no alternative between flight and destruction. The former was adopted. Numbers of the insurgents fell in the retreat. The town was pillaged and burned by the victorious Royalists. Two days afterwards Munroe was captured, tried by court-martial, and executed in front of his own house in Lisburn. His head was exhibited from the market-house on a pole. As regards the losses on both sides during the two days of the conflict, various statements have appeared -- none of them, probably, accurate. Gordon says that the loss of the rebels was about 150, and that of the Royal troops more than 40. Another account states that only 20 bodies of the rebels were found in the town, and 28 scattered over the surrounding country; and a third gives the number of insurgents killed on the field and in the flight as from 100 to 500. The forces of the latter on the 13th amounted, deducting for desertions, to over 5,000; that of the Royalists to from 2,000 to 3,000. The insurgents were routed after a hard contest; many of them were killed by the yeomanry in their flight, and among them a young girl of extraordinary beauty, named Elizabeth Grey, of Killinchy. She went into the action with a brother and a lover, determined to share their fate, mounted on a pony, and bearing a green flag. After the defeat the three fled, and on their retreat they were overtaken by a detachment of the Hillsborough Yeomanry Infantry, within a mile and a half of Hillsborough. She was first come up with, the young men being at a little distance seeking a place for her to cross a small river, and could easily have escaped. She refused to surrender, and when they saw her likely to fall into the hands of the yeomen they rushed to her assistance, and endeavoured to prevail on the captors to release her, offering themselves as prisoners in her stead. Their entreaties were in vain. Her brother and her lover were murdered on the spot. She still resisted, and it is said that a man called "Jack Gill," one of the cavalry, cut her gloved hand off with his sword. She was then shot through the head by Thomas Nelson, of the parish of Anahilt; aided by James Little, of the same place. The three dead bodies were found and buried by their friends. Little's wife was afterwards seen wearing the girl's earrings and green petticoat. You searched a summer day. To meet her gladsome eye. The neighbours loved her well. He loved, and was beloved again. And nought but death would part. To join the battle fray! "God bless the gallant three!" 'Twas morning when they reached the hill. Now woe be on thee, Anahilt! And with them Bessie Grey! The excitement and restlessness created by the political agitation that immediately preceded the insurrection in 1798 did immense injury to the country. Unsettled habits were giving a reckless tone to a large class of society, and the effect on industrial progress was most injurious. Many farms lay partially cultivated for two or three seasons, linen looms remained idle a great part of the time, and, as a consequence, the production of goods did not exceed two-thirds the usual average. Exports of finished linens, which amounted to forty-six million yards in '98. But during the intervening period preparations for open war had been stealthily carried on by the disaffected party. The Irish pike -- a rude and unsightly weapon -- was much prized by them, and the manufacture occupied many of the midnight hours of such workers at fire and forge as were engaged in that dangerous employment. A smith, celebrated for his make of weaver's shears, and who lived near Templepatrick directed much of his labour to pike-making, and was much patronised by the United men. In an entry off Ann Street, Belfast, a shuttle-maker often worked eighteen hours out of the twenty-four in turning out pike heads and handles. Hunders of dozen of these were sent to the depots in Down by the ingenious contrivance of packing them in puncheons. On several occasions the cart that conveyed a couple of these puncheons passed under the eye of Town Major Fox, that vigilant officer never dreaming but that the vessels were filled with the national beverage. According to the returns of the United Irishmen's secret committee, there were enrolled in the Country Antrim in 1797 a grand total of 26,720 men, 3,220 muskets, 1,120 bayonets, 350 pistols, 3,500 pikes, 100 swords, and 10 cannon, besides ample stores of ammunition. During the winter of 1797 and the spring of the following year a Lisburn whitesmith forged upwards of five hundred pikes, and all this was accomplished without leaving undone any of the ordinary work he was called to perform for his every-day customers. The linen markets of the Northern districts of Ulster were attended by great numbers of buyers about this time, and of that itinerant brotherhood none were more respected than Harry Munroe and Bartholomew Teeling. These gentlemen had been members of the Lisburn Volunteers, and when that body was ignominiously put down by the State, they both felt a full share of the general indignation at imperial ingratitude. Munroe was an Episcopalian, fondly attached to his Church, and Teeling, son of Mr. Luke Teeling, of Chapel Hill, Lisburn, belonged to the Catholic creed. Their career was remarkably unfortunate. In several points of character they were much alike, but Munroe was less mercurial than his younger friend, and had strenuously opposed many of the propositions introduced by the more excitable members of the fraternity. At no period of the insurrection had he contemplated taking the field against the Royal troops, and until a few days before the fight at Ballynahinch he attended to his business as usual; but from causes which need not be explained here, he was unexpectedly called on to take the command of the Irish army, and looking upon the call as a matter of honour he accepted it, without for a moment waiting to consider the magnitude of the responsibility he was about to undertake. The battle of Ballynahinch was fought on the 13th of June, 1798, and, as is well known, a complete victory on the part of the Royal army, and a total overthrow of the insurgents, followed that reckless attempt to meet well-disciplined soldiers in the open field. Munroe's followers were scattered like sheep, and had fled in all directions; but though sadly broken down by fatigue, and dispirited by defeat, the unfortunate general was among the last to the leave the field; nor did he finally abandon the scene until, as he had hoped, the remnant of his people had got into some place of comparative safety. For several hours he had roamed about the country, and though well known by many of the farmers, the large rewards offered for his apprehension failed to induce any of them to betray the secret of his hiding-place. To the honour of one of the loyalists he was concealed nearly two days, during which time he received all the attention a kind-hearted man could bestow on an ill-fated fellow-creature. But as the harbouring of any suspected person was at that time contrued into an offence of great magnitude, the hospitable entertainer of Munroe dare not run the risk of allowing him to stop at his place for any lengthened time, especially as patrols of cavalry were marching through the country on the lookout for straggling men of the routed army. On the morning of the 15th of June he was consequently once again obliged to seek shelter in some other quarter, and at break of day he left the cottage. Not daring to appear except in the most unfrequented parts of the country, he at length ventured into a small farmstead situate on the borders of Dromara, County of Down, and at nearly equal distances from the towns of Lisburn and Hillsborough. In that house he met a man named Holmes, to whom he offered five pounds -- all the money he had in his possession -- and a small parcel of shirts, to conceal him for some days, and until the opinion of Government should be known us to the prospects of pardon. To this proposal the fellow not only agreed, but he expressed the utmost sympathy for the misfortunes of the fugitive. Making sure of the cash and the shirts, he gave Munroe some refreshment, and, leading the way out of the cottage, placed him, as the fugitive had been led to hope, in a secure retreat at the end of a large pig-house, where he covered him over with bundles of straw. But as Holmes had never entertained the most distant idea of keeping faith with his captive, his first thought after leaving the place of concealment was how to make the most of that secret. With this view he set off to the next seat of military authority at Hillsborough, where he met four members of the local corps of yeomanry, known as the Black Troop because of their not wearing any uniform save a band of white linen round the left arm. To these men he reported what had taken place at Dromara. The fellows immediately armed themselves with muskets and bayonets, and proceeded to the place alluded to by the informer. As soon as they arrived there they pounced on their prey, dragged him from his hiding-place, and to guard against further they tied his hands behind his back. Finding himself betrayed, Munroe tried to soften his captors by stating that if they permitted him to get free a large sum would be paid to them by his friends. But either in the hope of obtaining a higher reward, or from the fear that, should they acceded to his appeal, the promise would not be kept, they refused to make any terms with him, and in great triumph marched their prisoner into Hillsborough. Believers in the doctrine of retributive justice will find much material to strengthen their faith in the after-history of the men who captured Munroe and received a handsome reward for their "loyalty." It is a remarkable fact that although each of them had some property at that time, they afterwards became miserably poor, and the longest-lived of the four was a mere pauper at the time of his death. Holmes, the betrayer of the unfortunate Munroe, was held in contempt and scorn by people of every class and creed in his own neighbourhood. From the day he violated his faith to the last hour of his life he was despised for his deceit and denounced for his treachery, and after dragging out a miserable existence he died as he had lived -- a wretched outcast. Under a strong guard the prisoner was marched off to Lisburn, handcuffed, and on arriving there he was confined for the night in a temporary prison in Castle Street. When it become known among his former friends that be had been taken prisoner, the utmost sympathy was felt for him. His clothes were much torn and his health had suffered materially under the fatigue of his fugitive life for several days before. Mr. George Whitla, a local cotton manufacturer, sent him a full suit of clothes, and the rector of the parish, the Rev. Dr. Cupples, who resided within a few doors of the guardhouse, had his meals regularly carried to him from the rectory during the period of his confinement. On Monday, the 17th of June, the trial came on before a court-martial, composed of officers belonging to the several regiments then lying in Lisburn Barracks and at Blaris camp. Among those officers, General Goldie and his aide-de-camp, M'Coy, were characterised as men of great austerity. In one case it is said that when a rebel soldier was about to suffer M'Coy pushed him up the ladder. The tribunal before which Munroe was tried sat in a large room situate near the guardhouse; and it is only fair to state that, if mercy rarely found a resting-place in that august assembly, justice was rigidly enforced. Short was the period of the court's deliberations; it required little proof to convict, and it was still easier to condemn. Only three witnesses were examined for the Crown, and the deposition that the prisoner had led the native troops at the recent battles being conclusive, the sentence of death was at once written out and Harry Munroe was ordered for execution. The culprit was immediately informed that he had not long time to live, and to make speedy preparation for the death that awaited him. On his way from that judgment-hall to the place of punishment he requested to be taken to the rectory, that he might receive the sacrament. That rite of the Church having been administered to him, he was led down the street to the Market Square, where a temporary gallows had been erected in front of Mr. Ward's stationery warehouse, and nearly opposite the woollen-drapery concern of which Munroe was proprietor. He was dressed in a black coat, nankeen knee-breeches and white stockings. A guard of the 23rd Light Dragoons, under Colonel Woolarston, and two companies of the local yeomanry, were drawn up before the place of execution. During all the preliminary arrangements the condemned patriot exhibited perfect coolness without putting on the slightest appearance of the bravado. One request alone he made, and this was -- while the executioner adjusted the fatal noose -- to beg the commanding officer's permission to see a friend who resided in the immediate vicinity of the spot where he stood. That request was granted, and when the gentleman appeared he addressed a few words to him in a low tone, just before he ascended the ladder leading to the gallows. What he said on the occasion was never known, even by the nearest relations of the friend into whose ear it was spoken. The moment the preparations had been made, Munroe leaped from the street up the ladder, but the slight rung on which he alighted having given way, he fell down against some of the guards by whom he was surrounded. Recovering his balance in a moment, although having his arms firmly pinioned, he said "All-right," and, refusing assistance, again mounted the ladder. When he had reached the required height the executioner, whose face was closely veiled by a piece of black crape, also ascended to the spot, and placed the rope round the prisoner's neck with an awkwardness of manner that proved him to be a mere amateur in the art of legal strangulation. Without waiting for the final act of the finisher of the law, the doomed man suddenly leaped forward, and as the body fell, and swung to and fro, a low wail of sorrow, which the military authorities vainly endeavoured to suppress, told how bitterly the tragic their fellow-townsman was felt by the multitude that thronged the place of execution. Many of his acquaintances -- many linen merchants who, in happier days, had stood side by side with Harry Munroe in the Linen-Hall, engaged in the usual pursuits of their business -- were around him at his last moments, and though several of them looked upon his conduct as that of the wildest and most misguided patriotism, his political opponents, as well as his personal friends, mourned heartily over the sad fate of the man whom everyone respected as a worthy and amiable citizen. When the body was taken down the final vengeance of the law had not been fully satisfied -- the authorities, who irresponsibly wielded the powers of life and death, having ordered that decapitation should take place after the execution of the first part of the sentence. On that savage act having been perpetrated, a dragoon seined the head and flung it into the air, shouting "There goes the head of a traitor." In this act of wanton ferocity the operator seemed to think that, in thus outraging the remains of an unfortunate fellow-creature, he performed an achievement worthy the glory of a British soldier. Munroe's head, with the white night-cap still on it, was afterwards stuck on a spike and placed on the front of the Market-House, the military authorities carrying out a custom barbarous as any ever practised by the most savage tribes of the New Zealanders. Some weeks afterwards a Scotch nobleman, in passing through the town, and feeling shocked at the disgraceful spectacle, had the head taken down and interred in the Lisburn Churchyard, in the same grave that contained the other portion of the mutilated body. Whatever may have been the errors of Henry Munroe as a politician, his conduct in private life was that of a perfect gentleman. Numerous are the anecdotes related of his light-heartedness and love of fun, and still more numerous are the stories told of his fearless conduct and disregard of personal danger. On one occasion, when attending the linen market of Lurgan, an alarming fire having been discovered in the church of that town, he exhibited the greatest courage in his efforts to stop the progress of the flames, and risked his life in assisting to save the building. Although warmly attached to what was then considered a righteous cause, he had never taken any direct part in the movements of the insurgent army until it became known that, at the eleventh hour, the ostensible leader of the native troops had refused to take the command. In consequence of that determination, the duty that should have devolved on another was forced on Munroe; but having accepted the office, he threw himself into it with all the enthusiasm of an over-sanguine disposition. Nothing, however, could tempt him to tarnish his fame as an honest friend and a manly foe. He was considered a very handsome man, and had ever been exceedingly fond of neatness in dress. At that time it was fashionable to wear a portion of the back hair very long, and this was tied with black ribbon and hung over the collar of the coat. Munroe continued to wear his hair in this form, but most of the United Irishmen cut off their "pig tails," hence the origin of the tern "croppie." During the short period of his leadership a circumstance occurred which proved that he considered the preservation of his honour as dearer than life itself. It appears by the histories given on both sides of the question that, on the eve of the Ballynahinch fight, the Royal troops were ranged on the Windmill Hill, near that town, and the insurgent lender had drawn up his forces along the north side of a mount in the demesne of Earl Moira, the town of Ballynahinch lying between the rival troops. A proposal was made to Munroe that he should attack and cut off the local yeomanry, several companies of which were then in Ballynahinch; and as numbers of them had been indulging in drunken carousal, and, of course, were unable to repel a sortie, there would have been little difficulty in overpowering the garrison and setting fire to the town. Against that proposition his generous and manly spirit at once revolted. Had he given his assent to it, a cold-blooded and terrible massacre would have been the inevitable consequence. "If we are to fight," said Munroe, "let us take the field like men, and do battle with all our might, but a national cause must not be stained by the cowardice of midnight assassins." There was the greatness of true heroism in this, but so much was the majority of the troops opposed to it that numbers of them deserted in course of the night. After the death of Harry Munroe many of the disaffected party were made prisoners and lodged in the Lisburn Guardhouse. Two of these people were tried and convicted, the sentence of death following close on the verdict of guilty. One of the condemned was Richard Vincent, copper and tin smith, a native of Lisburn, and the other was named Maxwell. These men were executed almost immediately after receiving sentence, and their heads, after being cut off, were placed on the Market-House beside Munroe's. Not many days after his execution, a sister of the general, one who had been celebrated as a heroine in the national struggle, was passing through the town, and when opposite the Market-House she gazed for a moment at her brother's head, and exclaimed aloud, "Ah, Harry, you will be revenged for all yet!" 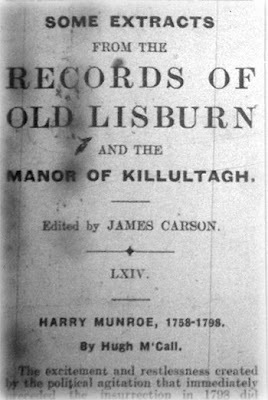 Harry Munroe's mother lived in Lisburn for many years after the "day of trouble," and supported herself respectably by keeping a little shop in the house situated on the Sluice Bridge, in Bow Street. She survived the death of her son about seventeen years. A United Irishman, who gave his name as Crabbe, was the first person hanged for treason in that town. He suffered death on a lamp-post at the corner of Castle Street, and right opposite the Market-House. The charge against him was having a pistol in his pocket and a green cockade hid in his hat. Some reports went to say that he had been a clergyman, but no direct proof of the fact was ever brought forward, nor did a single secret connected with his history transpire, from that day to the present. 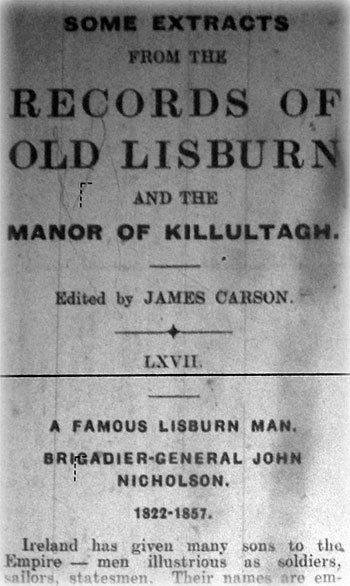 He was taken prisoner in one of the bye-lanes in Lisburn, and in three hours afterwards was tried, convicted, and executed.